Bed head on the balcony, with coffee. Those aren’t clouds — that’s the mountain. Darjeeling. We have moved to a guesthouse called the Highlander’s Inn. The family lives upstairs; we are the only guests downstairs. Itâ€™s a house on the edge, below the temple atop Observatory Hill. We found this little place by foot, by the view. 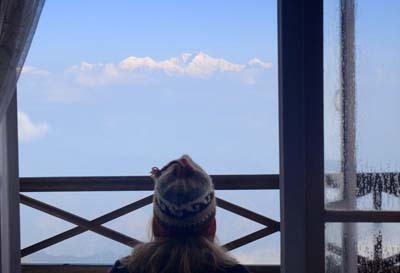 A kind young woman showed us to a small room with two walls of windows and a balcony that opens to Khangchendzonga. Kangchendzonga, the worldâ€™s third-highest mountain at 8,598 meters. To see the peak, we gaze upward a full Denali in height. We wake with breath swirling on cold air. Itâ€™s freezing, but the mountain gleams pink. I order coffee, and we bring our cups to the balcony. Sunlight brightens a string of Tibetan prayer flags draped across a patio below. Yesterdayâ€™s wash still hangs on the line â€“ Darjeeling laundry has some of the worldâ€™s best views. These hills go straight down; small paths zigzag through neighborhoods that lead to the Tibetan Refugee Self Help Centre, then farther down through tea plantations before the earth ends at a valley floor barely visible from here. And then the land rises again on the far side, up and up past the clouds, up past 8,000 meters, to rocks and snow that fetch the morning sun. This view, this cold, this brisk morning costs us $15, plus a little extra for coffee.